We have been following a strategy. The first task was to create enough therapists so that if we had a referral we would have a therapist who was trained and willing to see them, within a reasonable distance. We still have huge gaps (see the map of StopSO therapists, it is not quite up to date, but gives you the sense. Green and blue dots mean the therapist is trained and approved and ready to go. Other colours mean we are awaiting reports from their supervisor or professional, or they are awaiting further training. You will note that there are some areas with BIG gaps. 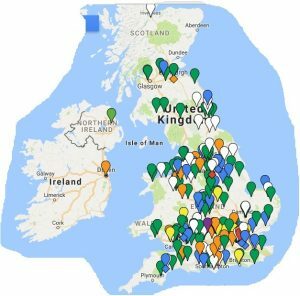 And we don’t have that many therapists in London, our furthest north is Inverness, mid and North Wales is under-represented, Norfolk and Suffolk needs more….and so on.